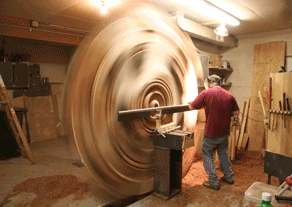 Barkby Woods, established in 1991, is located in Dover, PA, and is owned and operated by Dave Barkby, an internationally known artistic woodturner. Dave is best known for his wall sculptures, ranging in size from 36” to 120” in diameter. Dave makes several trips a year to California to hand pick each and every Buckeye Burl, and over the years has become very adept at picking and choosing the best burls to produce the highest-quality, unique woodturnings. Dave is shown cutting a Buckeye Burl into 3″ slabs for both his customers’ as well as his own use. 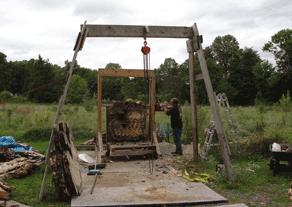 Also available are whole, half, or quarter burls. Kiln dried slabs are available. For more information or to place an order with personal attention, call Dave at: SHOP (717) 266-4690 or CELL (717) 870-1495, email him at dbarkby@comcast.net or write to 5015 Lewisberry Road, Dover, Pennsylvania 17315. For your convenience, we accept cash, checks, MasterCard and Visa. All inventory is up to date as of December 22, 2014.